He was very helpful and he didn't rush the job. He put a lot of time and effort into getting the right parts for a job that no other company would take on. They did an excellent job. They have a lot of knowledge and experience in regards to relay systems for older homes. They were on time and efficient. When I looked in the Diamond Certified Directory to find an electrical contractor, Aren Electric was the only company who had any sort of experience doing relay systems in my area. They've been in business for quite some time, so there's really nothing in the electrical world that they can't do. I would recommend their services. They don't 'BS' or upsell their customers. They're completely honest and there are no surprises when using them, which is fantastic. He is very thorough, he explained everything, and he gave me options on how to fix different things. He did exactly what I wanted to do and he solved the problems. I like his integrity. They worked very hard. 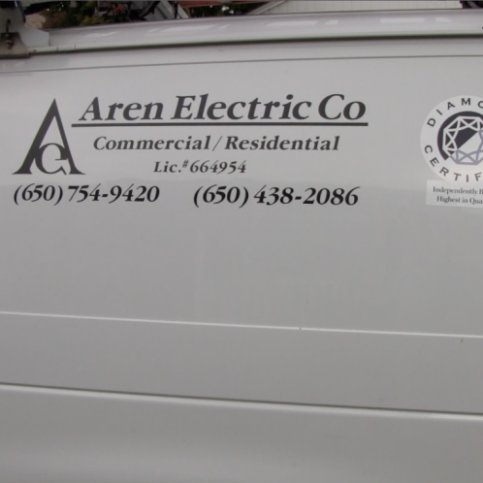 Aren Electric Co., Inc. provides a variety of electrical repair and installation services for residential and commercial clients throughout the Peninsula. In addition to handling electrical wiring circuits for appliances, lighting, receptacles and other household applications, the company specializes in electrical panel upgrades, performs comprehensive electrical safety inspections and more. DIAMOND CERTIFIED RESEARCHED CAPABILITIES ON Aren Electric Co., Inc.
Company Name: Aren Electric Co., Inc.
DIAMOND CERTIFIED RESEARCHED ARTICLES ON Aren Electric Co., Inc.
An Aren Electric Co. technician works on a residential wiring project. Aren Electric Co. has been providing electrical repair and installation services for residential and commercial clients throughout the Peninsula and San Francisco since 1994. In addition to handling electrical wiring for switches, circuits, home entertainment systems and other household applications, the company performs comprehensive safety inspections, installs new circuits and outdoor lighting systems, and more. The importance of ground fault circuit interrupters (GFCIs). The average homeowner might not even know what a ground fault is, but when a house’s ground fault is compromised, it can put the entire property in danger. Basically, a ground fault is an inadvertent electrical path between a power source and a grounded surface. While all electrical devices and appliances are “grounded” to ensure they can be safely operated by consumers, devices can still lose their grounding and divert electrical currents to the nearest channel that provides a path to the ground: the body of the consumer. This is where the ground fault circuit interrupter (GFCI) comes in. A common safety feature that can be identified as two small buttons located in between the two sockets on an electric outlet, the GFCI’s function is to constantly monitor the power current flowing through a circuit. The moment the GFCI senses even a small disparity between the current flowing into the outlet and the return current, it intervenes by shutting off the power to that outlet. GFCIs are effective because they’re able to quickly sense dangerous situations and interrupt the current before it administers a potentially fatal electric shock. Because of the ever present danger posed by the possibility of a ground fault (particularly when water is involved), GFCIs are required by the electrical code for outlets in bathrooms and kitchens, on the exteriors of buildings, and near swimming pools. Q: Can you come out on the day that I call? A: It depends on our schedule, but sometimes we can come out the same day. A: Our approach to quality control is linked to the pride we take in our work. We make sure all our work is performed to the standards we would want in our own homes. 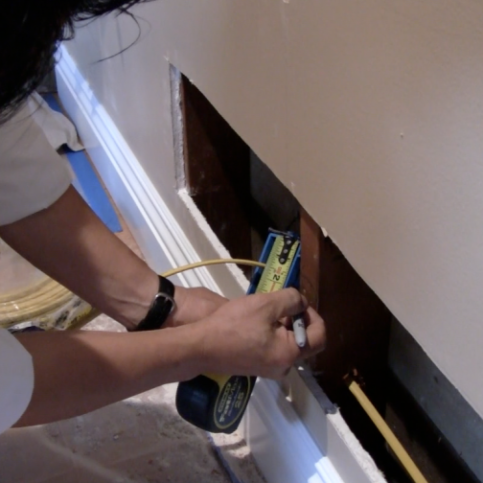 We’re very thorough, and we always investigate each situation before we install a new outlet or breaker to ensure everything is safe and supported. Q: I have a lot of electronic devices but not many outlets, so I use a lot of extension cords and power strips. Is this safe? A: Not really. Using a lot of extension cords adds to the power load borne by your circuit, which can lead to overheating and cause the breakers to trip. In this case, we’d recommend adding some additional outlets to your home. Q: It looks like rats have chewed off some of the insulation on my wiring. Can I wrap the wiring with electrical tape? A: It depends on the extent of the damage. If it’s just a small area on the wire, electrical tape should be an adequate remedy. However, if the damage is more extensive, you should call us to replace the wire. A severely damaged or exposed electric wire is a major safety hazard—if you touch it, you could get electrocuted. Q: Do I have to be home when you’re conducting a safety inspection? A: Not unless you want to hear what the inspector has to say during the process. SELECTED PHOTOS FROM Aren Electric Co., Inc.
Gerry Reyes is a 29-year veteran of the electrical industry and owner of Aren Electric Co., Inc., a Diamond Certified company. He can be reached at (650) 564-3636 or by email. Following his stint in the Air Force, Gerry worked in a couple related industries before eventually striking out on his own. “My first job after the military was as a copy machine technician,” he says. “The company was going to send me to training school, but since I had a strong background in electronics, I was actually able to read the schematics and fix the machines without any additional training.” Gerry’s next job was working for American Airlines as a maintenance mechanic. “We took care of all the jet bridges, and we also repaired and maintained the x-ray machines and security devices.” After a while, Gerry decided to leave and fulfill his dream of starting his own electrical contracting business. In 1994, he founded Aren Electric Co., which he continues to operate nearly 20 years later. While Gerry concedes that owning a business involves a lot of hard work, he finds the sense of independence it gives him to be very gratifying. He also draws inspiration from the variety of people he meets while on the job. “One of the things I enjoy most is meeting new people, talking to them and learning how they live,” he says. “Seeing other people who have been successful in life motivates me to work harder and strive for more.” Outside of work, Gerry enjoys taking part in outdoor activities like golfing, basketball, running and fishing on the bay. A: Hawaii. Besides the weather, I really like the local people. I’ve made a lot of friends there, and I like to hang out and drink coffee with some of the retired folks. A: Christmas time. I like the songs, smells, food and family gatherings—just the whole spirit of the season. DALY CITY — Ground fault circuit interrupters (GFCIs) can be found in most residential bathrooms and kitchens, but not everyone understands the significance of the small buttons and little green light on the electrical outlets in their homes. 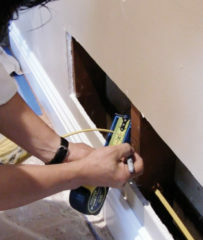 In fact, GFCI’s are a very important aspect of home safety. “Ground fault” is a term for a disruption that can occur in the low-resistance grounding path from a tool or electrical system. In the event of a ground fault, the electrical current may take an alternate path to the ground through the user, resulting in electrical shock. A GFCI protects the user by sensing this disruption and shutting off the power before contact is made between the electrical current and the user. Since one potential cause of a ground fault is an electrical device coming into contact with water, GFCI’s are most often located in areas like kitchens, bathrooms and garages. All GFCI’s have a green indicator light to show that the power is on and the outlet is protected. If a GFCI’s indicator light isn’t lit, it may have been tripped, which shuts off the power to that outlet. To restore power, press the “reset” button. You should test the GFCI’s in your home on a monthly basis by pressing the “test” button—this will trigger an artificial ground fault, which should shut off the power. After testing, press the reset button to restore power. DALY CITY — Host, Sarah Rutan: GFCIs or Ground Fault Circuit Interrupters are important parts of your electrical system. 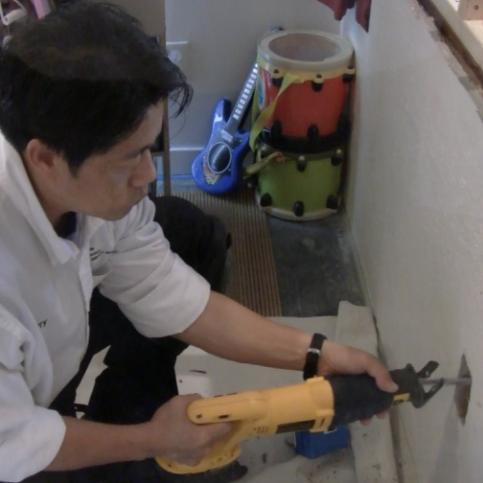 Today, we’re in Daly City with Gerry Reyes of Aren Electric Co. to learn more about how test and maintain your GFCIs. Diamond Certified Expert Contributor, Gerry Reyes: The GFCI receptacles have been found in the kitchen, countertops, which is a code and also bathrooms. garages, outdoors, and the purpose of it is it’s a ground fault. Something happens like a cord gets cut, this GFCI receptacle will turn off automatically by itself in a split second to prevent any injuries. You can test this monthly by pressing the test button, just what I did and then as you can see the light went off and that means this receptacle is off right now. Then you can reset it and it goes back to normal again. Host, Sarah Rutan: To learn from local top-rated companies, visit our Diamond Certified Expert Reports at experts.diamondcertified.org. Diamond Certified RATINGS ON Aren Electric Co., Inc.
Aren Electric Co., Inc. : Average 9.8 out of 10 based on 94 unique customer surveys of customer satisfaction. That they are very knowledgeable about things and it feels like you are getting honest, hard work. Explained everything they said they would do before they did and they cleaned up every piece of equipment and saw dust. I thought they were tremendously trustworthy and honest and very thorough and helpful. While they were doing the assigned project, they commented on other electrical risks that I was unaware of. They were extremely knowledgeable and very experienced and very nice and very cooperative. I think that I trust them and I was confident that I was getting top quality help and that I could rely on their work. I probably wouldn't have that opportunity. The work was sufficient and prompt. He fixed the things that needed fixing and he was congenial and on time. Aren Electric is reliable and they get the job done at an affordable price. Just the attention to the job and getting it done quickly. Very good, very high quality work, and they do it well. That they do an excellent job, they are very professional, and we would not hesitate to recommend them. They did what they said they were going to in a timely manner and they were professional and we didn't have to worry about the quality of work. They did a good job and they were very pleasant. He is very good. He has a strong electrical background. When he does his job, if he sees something that needs to be done, he will mention it to you and he will take care of it. Very detail oriented and they will go the extra mile to do things right. I think they are great and I have worked with them several times and all of their work has been amazing. I think they are honest, punctual, helpful, and I would definitely recommend them and use them again. I think they were able to do an assessment of what I needed and provide a thorough estimate and give an opinion about what needed to be done first. It was very collaborative and they were great. They are very reliable and you can depend on that it will be done well and they are very good. He knows what he is doing and he is very helpful and he will help you choose the right thing. I think his advice and he did very good work and we no longer have to worry about the fixture, but they were very expensive. I feel confident that he fixed it and I don't have to worry about it anymore. That he is competent and he does what he tells you he will do and he does it as efficiently as possible. That he explained everything that he was going to do and the things that he had to rely on, such as PG&E, depended on things like PG&E. I think he is worth it. The owner William is great at what he does. The company is very thorough.